Should you get extra lenses for your iPhone? Count me in. The iPhone is now the only camera I use. That said, while I remain overall satisfied with this decision, I do miss some of the features of my old stand-alone camera—in particular, I miss having a zoom lens. Yes, the iPhone has a digital zoom, but this is more digital trickery than a true zoom capability; it’s really not much different from cropping a photo. What I want is an optical zoom, but the holy grail of my search—a small but high-quality zoom lens for the iPhone—sadly does not exist. There are other options: The next best thing is one or more accessory lenses from companies such as Olloclip or iPro. The available lens styles include wide-angle, fisheye, macro, and (most recently) telephoto. Adding any lens requires some sacrifice in convenience from carrying around just an iPhone. The big question is: Is the sacrifice worth it? External lenses can let your iPhone get shots it otherwise couldn't take, but they come with trade-offs. There is no single answer to this question: It varies, depending upon your photographic demands and tolerance for added inconvenience. I had the chance to determine my answer when Olloclip offered me a set of their lenses to review. Before I tell you the results, allow me to back up a bit. There was a time when I owned an Olympus 35mm SLR, complete with several lenses, filters, a flash, a tripod, and more. When traveling, I stuffed all this equipment into a canvas camera bag. For a time, I even owned a separate video camera, dating back to those VHS behemoths that required you rest the camera on your shoulder. Looking back, I can no longer imagine how (or even why) I carted all that stuff around, other than there being little in the way of alternatives if you wanted to capture those moments of your life. When digital cameras arrived, I traded in all my equipment for a good Canon point-and-shoot camera. It had a 5x zoom and could take both stills and HD video. It wasn’t primarily the digital technology that prompted the switch, rather that my photographic aspirations had become more modest over the years. At the time I was mainly taking “memory shots” of family, friends, special occasions, and places I visited. For those tasks, a point-and-shoot proved to be more than adequate—and much more convenient to carry around than the SLR and camcorder. And that’s where things stood for several years—until I got an iPhone. For the iPhone’s first several iterations, my habits didn’t really change; my iPhone’s camera mostly sat idle. I used it only for occasional situations where all I cared about was having a record of the content (such as taking a picture of a sign in a store). Or when I didn’t have my Canon with me and had no alternative. For everything else, the iPhone camera’s image quality was simply too poor for it to be my preferred choice. But with the iPhone 4s, the balance began to shift. Back in 2012, I wrote an article asking whether the iPhone 4s’s camera was good enough to replace my point-and-shoot. The answer was “not quite—but almost.” The following year, with the arrival of the iPhone 5, that answer became a definitive “yes.” The quality of the iPhone’s photos was now so good that it no longer seemed worth carrying an extra device. Plus, with the iPhone, I could easily edit photos on the fly and post them to the Internet. And, via Apple’s Photo Stream, my photos were instantly accessible from all of my other Apple devices. None of this was possible with my point-and-shoot. The iPhone 5 had the first camera good enough to convince me to drop my point-and-shoot. Sure, there is sacrifice involved. The iPhone lacks manual controls for film speed, exposure, and other advanced features. Most of all, as I noted at the top of this article, it doesn’t have a zoom lens—and I especially wanted that telephoto capability. There were just too many situations where the iPhone prevented me from getting as “close” to my subject as I wanted. Still, I decided to go with just the iPhone. And that’s where matters stood when I began field-testing the Olloclip lenses. I quickly determined that the only one of Olloclip’s lenses I would use regularly was the telephoto, so I left the others at home, except for special occasions where I knew in advance that they’d prove useful. The telephoto lens is sufficiently small that it’s almost no bother to carry it around in my pocket and, while I don’t take the lens with me all the time, I try to take it whenever I expect to be using the iPhone’s camera. In truth, I was even initially concerned about the value of the telephoto lens. At only 2x magnification, I wasn’t sure it would be worth the trouble. There’s good news on that front, though: even a 2x zoom can make a big difference. While it’s obviously not enough for every situation, there have been many times when shifting to the telephoto lens has brought my desired subject front and center. The lens’s image quality is excellent overall, except that the left and right edges of shots are frequently blurred. You can see this in the comparison photos below. Left: Photo taken with the iPhone 5s’s built-in lens. Right: Same scene taken with the Olloclip 2x telephoto lens attached. The Olloclip lenses work by sliding over the iPhone’s built-in lens. This means that each time you want to use a different lens (such as going from wide-angle to telephoto), you need to take off one lens and put on the other. Similarly, even when using one lens, you have to take it off and put it back on to compare compositions. This is especially problematic when you need to act quickly to capture a shot. Too often, by the time I got the lens out of my pocket and out of its bag and mounted on my iPhone, the shot I wanted was gone. Making matters worse, the plastic clamp that holds the lens to the iPhone grew looser over time. At one point, the lens fell off as I was getting ready to take a shot. Luckily, it landed softly and didn’t break. I found that I could squeeze the plastic back together and restore the grip—at least until the next time it loosened. Still, it’s a bit unnerving. As you’ve probably guessed, the lenses don’t fit over most iPhone cases. Assuming you already have an iPhone case, you have three options: (a) remove the case whenever you want to use a lens, (b) give up on using a case, or (c) get the Olloclip Quick-Flip case. With this case, you swing away a hinge-connected piece to expose the spot where the lens attaches. I decided to go with the Quick-Flip; it’s worked well and I now keep it on all the time. 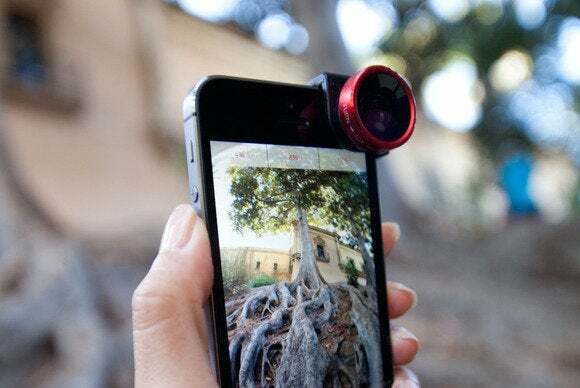 Of necessity, Olloclip lenses are designed to fit the shape of a specific iPhone. In my case, the lenses only fit an iPhone 5 or 5s; this also means that each time a new iPhone comes out—assuming you plan to upgrade—you may have to give up on your lenses and potentially purchase a new set. This can be a significant and continuing financial burden. That’s why, if you are currently considering buying iPhone lenses and also plan to get an iPhone 6, you’re probably best off deferring any lens purchases until after the dust settles. So, after weighing the pros and cons, which way does the balance tip? For me, the telephoto lens has proven its worth, if only by a narrow margin. I’ll probably get a new one to work with an iPhone 6. As for the wide-angle, fisheye and macro lenses … no. There’s nothing wrong with the other lenses; they do what they claim. I just don’t have a strong need for them and I certainly can’t justify paying to get new ones after upgrading to a new iPhone. Clearly, others may disagree here. More generally, I found working with multiple iPhone lenses to be sufficiently inconvenient that it would be preferable to return to a point-and-shoot camera. In the end, what I’d really like is for a future iPhone to provide a standardized way to add lenses, such as via a bayonet mount (as has been rumored to be in development). This would allow you to use the same lenses across iPhone upgrades. Even better would be an iPhone with a built-in optical zoom. However, I believe such a lens is currently not possible without being unacceptably bulky. Still, with all the people who seem to be happy using their iPhone as their main camera, it’s not out of the question that the situation might some day change.